Neil deGrasse Tyson will be their only guide, when he appears in “the form of an augmented reality that only they can see and hear. Within this series, President Donald Trump is going to be presented as an antagonist, but he won’t be seen directly. “In this way, he is like our Doctor Claw from the original Inspector Gadget cartoon. A villain to be heard and felt but not seen. Except for his tiny hands, we’ll see those. Don’t think you won’t get any goodies for backing the series. A $10 contribution gets you a 5×7 color illustration of Barry & Joe on horseback while Joe eats ice cream. Own the concept artwork in all it’s glory! 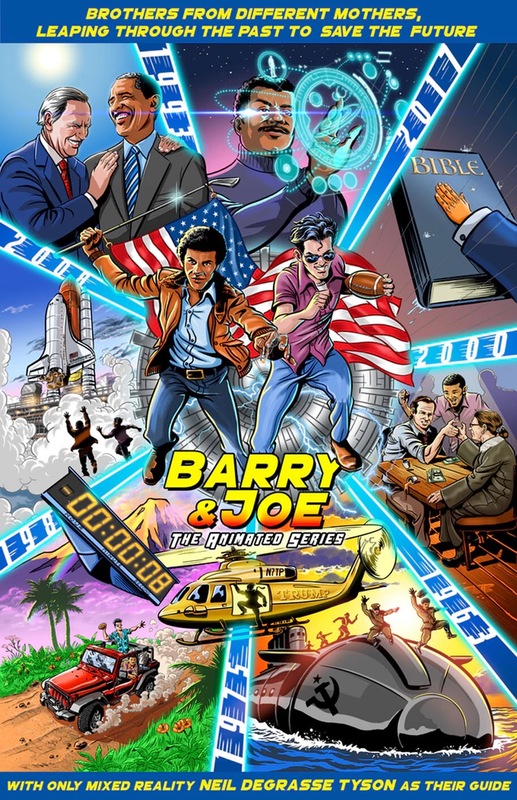 Your very own 11” x 17” Barry & Joe poster also features the likeness of Neil deGrasse Tyson, Notorious RBG thumb wrestling, Trumps tiny orange hand and much, much more! There are way more tiers and awesome stuff. The project needs about $80k more by the end of the month or it doesn’t happen. 21 days. I’m in for $25. You?